About a year ago, I cracked open Introverts in the Church for the first time in several years. Contrary to what some may believe, we authors don't cuddle up to our books on cold nights. I had moved on to other topics, namely The Listening Life, and some other writing projects. I had been wrestling with questions, once again, about how to approach some new relationships in my life as an introvert, and I thought to myself, "You know who's an expert on this topic? ME!" So I dusted off my copy of Introverts in the Church and immersed myself in chapter 5, the Community and Relationships chapter. What I found is that while my advice is helpful, some of it already feels outdated. It is astonishing how much things change in 8 years. In 2009, when the book was published, everyone in the church was talking about postmodernism; now, I almost never hear that word. In 2009, I didn't even know the phrase "social media," and the iPhone was just starting to flood the market. I started writing Introverts when I was 29 years old, even though the book wasn't published until I was 33. I will be turning 41 in a few months, and needless to say, I have changed, as a person, as a writer, and as a believer. I was a decent writer when I was 29, but I am much better now, and one of the things I noticed, ironically, is that the book is just too wordy. I can tell I was dealing with what they call "Imposter Syndrome," a common struggle with a first book, and I wanted to prove to everyone, myself included, that I was qualified to write a book. I dropped in all kinds of theological knowledge and research that just wasn't necessary and was, in some cases, distracting. That, combined with the outdated time stamps in the book, compelled me to approach InterVarsity Press last summer and ask if we could release a 2nd edition. I wanted to write a new version that had a more timeless, and succinct, feel to it. And I thought I could make the book a lot funnier. 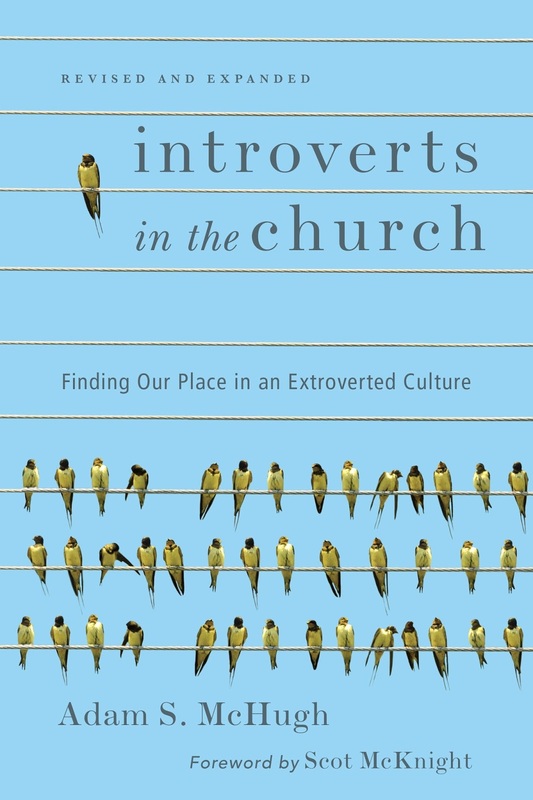 Today, I am thrilled to announce that the Revised and Expanded Version of Introverts in the Church is now available for pre-order. Here's what's new: each chapter has been thoroughly revised, both in content and in flow. I have written a new introduction. I have interspersed more discussions about the struggles of introverted parents and ministering to introverted children. I have incorporated the new research that has been conducted in the last few years about introversion, neurology, and sensitivity to stimuli, as well as some recent studies on the effectiveness of introverted leaders. And I have brought in the work of the Queen of Introversion, Susan Cain. There are also some new endorsements. Scot McKnight wrote the forward, and he says "the first edition was exceptional, the second even better, at least by half, perhaps more than that." Jenn Granneman, creator of the popular introverted community, Introvert, Dear, writes: "Introverts in the Church is thoughtful, validating, and charming. It’s the book for any church-goers who have ever wanted to disappear into their seats when the pastor said, “Turn and introduce yourself to three strangers.” Adam teaches an important lesson: Spirituality should not be measured by sociability. The introvert who quietly reflects on her faith is as true of a believer as the extrovert who preaches exuberantly to others." There are also endorsements from Susan Cain, Lauren Winner, John Ortberg, and many others. I echo Emily Freeman's hopes when she says, "I have a hopeful vision that the giftedness of the next generations of introverts will be honored and celebrated thanks to the fine work of Adam S. McHugh in this timeless, important book." 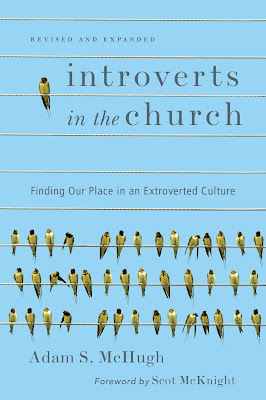 You can now pre-order the revised version of Introverts in the Church on Amazon and Barnes and Noble. Pre-ordering guarantees you the best price, as the price will decrease at times over the next few months, and it is a helpful way to draw the attention of retailers and reviewers. The official release date is August 7, 2017, but if you pre-order the book you will have it in your hands around mid-July. While the new edition will be of particular interest to new readers, those of you who read the first edition will find plenty of new content. As always, I am deeply grateful for all of you who have read the book, recommended it to others, and sent me emails about it. I liked the first edition of Introverts in the Church, but I like the 2nd edition much, much better. I think you will too.